Ignore the pundits’ petrified bleating over rising interest rates. Sure, the yield on the 10-Year Treasury has spiked to 2.9%, but you’re still not retiring on it! Look at it this way: if you dropped, say, $500,000 into Treasuries tomorrow, you’d still only get $14,500 in income. That’s just a hair over the poverty line of $14,342 for two people aged 65+ living under one roof. That’s an insult after a lifetime of hard work! And it’s exactly why I’m going to show you 3 simple steps you can take to rack up safe dividends that average 6.6% now (and some go well beyond 9.4%). That’s more than double the yield on the 10-Year and triple the pitiful 1.9% you’d get from the typical S&P 500 stock. Plus there’s easy double-digit upside for you here, too. CEFs deserve a spot in your portfolio for one simple reason: dividends! Look at the latest numbers from BlackRock showing the average yields on the main CEF sectors. When you average these sectors out, you get a gaudy 6.6% payout. So if we swing back to our investor sitting on a cool half-mil, they’d be getting a tidy $33,000 income stream from your “average” CEF. That’s more like it! Which brings me to the other benefit you might love even more than CEFs’ outsized payouts: a predictable shot at fast double-digit upside. That stems from one figure you can easily find on any CEF screener worth its salt: the discount to net asset value (NAV), or the difference between a CEF’s market price and what it’s underlying portfolio is worth. 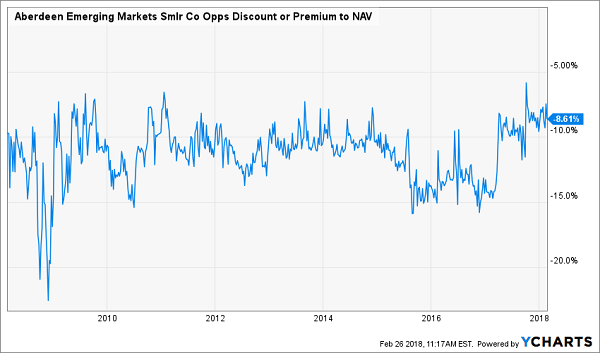 We don’t have to get into detail here; the upshot is this: getting in on a CEF trading at a big discount to NAV can unleash exciting gains as that markdown slams shut (or better yet turns into a premium to NAV). 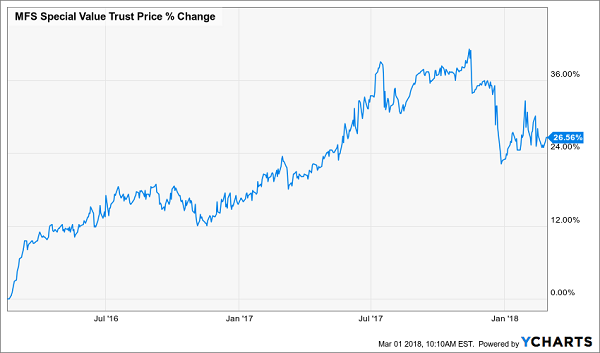 This is the fun part of investing in CEFs—and it’s exactly what happened for folks who bought the MFS Special Value Trust (MFV) in February 2016. At that time, MFV traded at a totally unusual 12% discount to NAV. And don’t forget that half of that gain was in cash! Today, with MFV well into premium territory, that “discount afterburner” is spent—and I never buy CEFs at a premium, especially when there are still plenty of bargain funds out there. A hefty discount isn’t much good if that window never closes. That’s why you need to look beyond a fund’s current discount to its historical discount to see if you’re seeing an unusual pattern you can profit from … or just another laggard (which, to be perfectly honest, most CEFs are). Take the Aberdeen Emerging Markets Smaller Company Opportunities Fund (ABE), which trades at a 7.6% discount to NAV. Sounds great, right? Too bad ABE’s been bumping along at a big discount for years. 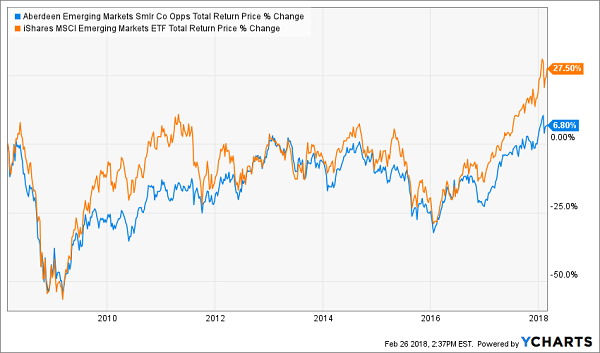 No wonder the fund has badly trailed the iShares MSCI Emerging Markets ETF (EEM) over the past decade—even with dividends included! In the past 12 months, ABE’s average discount to NAV has averaged 9.5%, and the 52-week low is 14.4%. That means the current discount is more likely to widen, not draw closer to NAV, weighing down ABE’s share price even more. Many folks flee from CEFs before they even get started. Why? Because they look at the fees, compare them to what they pay on passive ETFs … and that’s where the conversation ends. 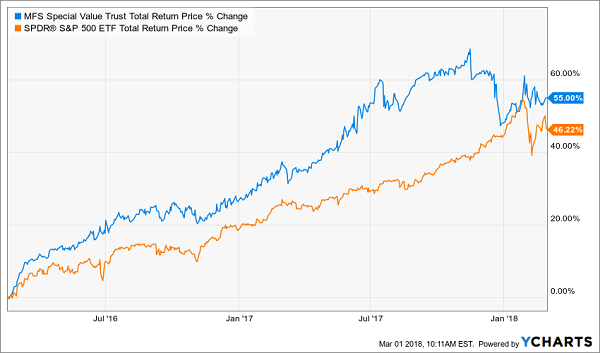 After all, with the likes of the SPDR S&P 500 ETF (SPY) charging almost imperceptible fees of 0.09%, what to make of CEFs like, say, the Gabelli Dividend & Income Trust (GDV), which charges 1.4%? GDV’s win may look narrow, but again we’re talking total returns (including dividends) here, and this fund is throwing off a 5.8% yield today—more than tripling SPY’s payout—so a big chunk of this gain was in cash. I’m happy to pay GDV’s 1.4% fee for a return like that. And also keep in mind that CEF fees come out of the fund’s NAV, so it’s not like you’re getting a bill here. It often pays to wait till a CEF has at least a couple years of history behind it, because these funds always trade at a premium in the early going. That’s because the IPO costs weigh down the fund’s NAV, pulling it lower than the share price, and it can take a while for this to work itself out. Take the RiverNorth/DoubleLine Strategic Opportunity Fund (OPP), which launched in late September 2016. Today you can grab shares at a 5.9% discount to NAV, but if you’d bought at the IPO, you would have paid a 2.2% premium. Ouch! 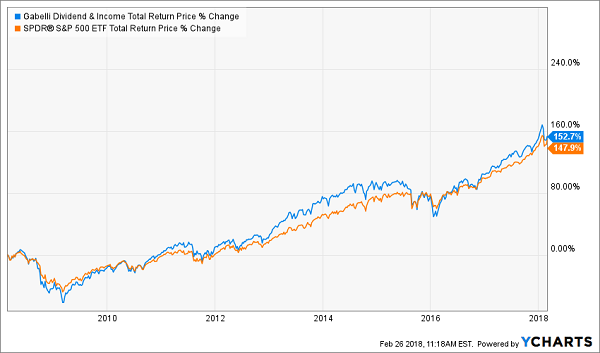 You can see this happening again with the latest IPO, the Dreyfus Alcentra Global Credit Income 2024 Target Term Fund, Inc. (DCF), which launched in October 2017 with a 1.6% premium. That rose as high as 3.8% in November before turning south. DCF now trades at a 1.9% discount. My prediction: that markdown will likely widen further before heading back for premium territory, so hold off a while before even thinking of giving this fund a look. As I just showed you, when you combine a big discount to NAV and a fat dividend yield, you get nothing less than the perfect retirement investment. That’s why CEFs make up half of my powerful 8% “No-Withdrawal” retirement portfolio. 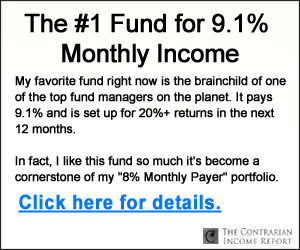 A 9.1% payer trading at a ridiculous 7.5% discount to NAV: This bargain-priced bond fund is run by one of the smartest minds in the business. Your strategy here is simple: BUY, grab that incredible yield and wait for your upside as the discount vanishes—as it must. An 8.8% payer with a buyback secret! Every time this one moves lower, management executes its smartly run buyback plan, throwing a floor under the share price and setting it up for “locked in” upside. A totally ignored 8.5% payer that not 1 in 1,000 people even know about. A sky-high average 8.0% payout that delivers a cool $40,000 yearly income stream on your $500,000 nest egg! Monthly dividends, as almost all of these investments drop cash into your pocket every month, not every quarter. Unbeatable safety, thanks to the portfolio’s incredible diversification across just about every asset class you can think of—preferred shares, REITs, US stocks, foreign stocks, bonds and more. All the top-secret investments in this one-of-a-kind portfolio are waiting for you now, and I can’t wait to take you on a free tour. 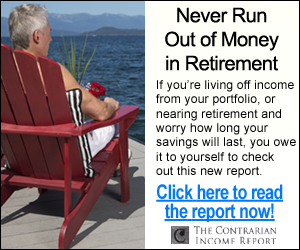 All you have to do is CLICK HERE and I’ll give you my full retirement strategy, including the names, tickers buy-under prices and more on the 6 investments in this unique portfolio.